The New York Lease Termination Letter Form is a legal document that may be used by either landlord or tenant to provide the required 30 day notice to vacate the rental premises. Either party may provide this notice one to the other and it will be considered sufficient legal notice to vacate. The document is easy to understand and complete. 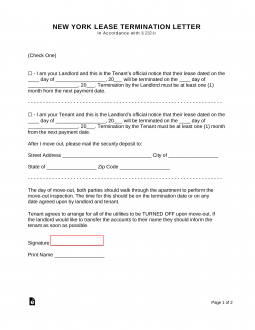 Step 1 – Landlord – If you are the landlord sending this notice to a tenant check the first box. Step 2 – Tenant – If you are the tenant and would like to provide rental termination, check the second box. Both parties should plan to walk through the property on the day that the premises is being vacated. The tenant must arrange to move or have the utilities and/or services turned off when the move out. If the landlord would like the utilities changed over to their name, they must be responsible to give the tenant ample notice to do so. Step 3 – Signature – Either party who is sending the notice must provide signature and printed name.